In marketing the D3400, Nikon is clearly targeting casual photographers who tend to use their smartphones to take pictures most of the time and are looking to improve image quality. “Before the D3400, you chose your smartphone camera for convenience. Zooming was clumsy. Shooting in low light was nearly impossible. Capturing fast action was a game of luck. But after the D3400, you’ll see that you were compromising image quality,” Nikon states on its website. The successor to the D3300 comes equipped with a 24.2MP sensor with no optical low-pass filter and Expeed 4 processor, which Nikon boasts will deliver crisp, clear images in low light situations and high-speed shooting. In addition, the Nikon D3400 also features an 11-point autofocus system, ISO range of 100-25,600, 5-fps continuous shooting, and 1080p video at up to 60 fps. 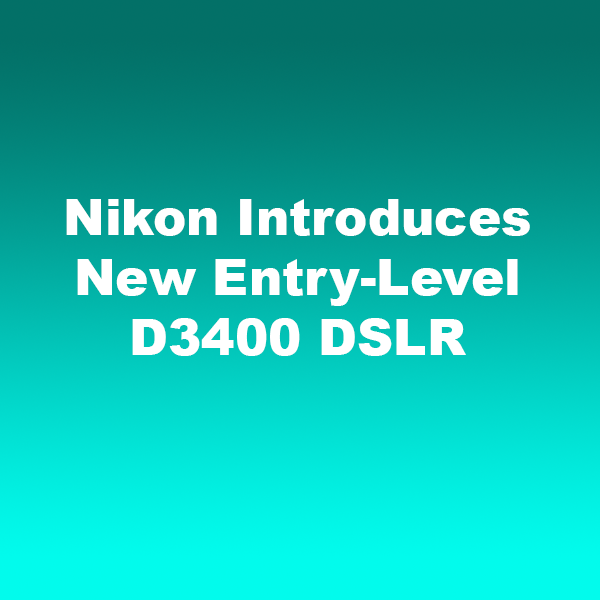 The most significant upgrade is that the D3400 comes equipped with Nikon’s SnapBridge application, which allows photographers to transfer pictures to a smartphone or tablet using “always on” Bluetooth technology. The battery will also last up to 1,200 shots, which is nearly double the life of the D3300. The only notable disappointment is the lack of 4k video. To compliment the D3400, Nikon also introduced a new line of dedicated lenses. The 18-55mm f3.5-5.6 lens and 70-300mm f4.5-6.3 telephoto lens both feature a new pulse motor, which utilizes stepping motors designed to ensure quiet and fast operation. They both are available with or without VR image stabilization. The D3400 starts at $649.95 and comes equipped with the 18-55mm VR Lens. The two-lens kit will cost $999.95. Consumers can also purchase the 70-300mm lens with vibration reduction on its own for $399.95. All of the products will be available in early September.